Facebook may be favored more by grandparents than teens these days, but the social network is taking steps to keep its interface innovative. 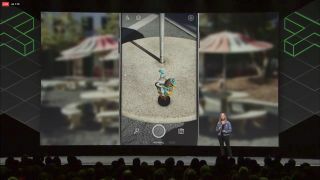 After announcing plans to allow 3D objects in Facebook posts at last year's Oculus Connect conference, Facebook is finally showing off the technology in action. LEGO, Jurassic Park, Sony, Wayfair and other brands all released posts today with embedded, rotatable 3D objects. Facebook Product Manager Aykud Gönen said in a blog post the 3D objects use “industry-standard gITF 2.0” formatting, and that artists will be able to directly drag and drop 3D images into Facebook posts. This means easier sharing of even richer, more varied 3D content, Gönen said. With the 3D Connect app on your Sony Xperia XZ1, XZ1 Compact or XZ Premium phone, you’ll also be able to snap 3D photos, then post them directly to your Facebook News Feed. Sony is just one of Facebook’s first partners, and other apps will be able to easily use the tools to enable 3D sharing support. While Facebook users with 3D-enabled camera phones will no doubt use this technology, brands like Wayfair and LEGO can also now show off their products at every angle. Until 3D posts become the norm, they will definitely catch the attention of users that typically scroll past ads without a thought. Facebook, meanwhile, has already said that it wants Facebook Spaces users to post their silly 3D creations online, and will no doubt enable Oculus Rift users to post to Facebook without having to take off their headsets. The end goal, Gönen said, is “enabling interactive animations and bringing 3D content into the real world using AR.” That last part is especially intriguing: Facebook's rumored AR glasses would certainly benefit from a large library of 3D models that could be projected into reality.